The following is a clear legal verdict regarding the mawlid from a scholar who is respected across the different schools prevalent in the Indian Subcontinent as well as the Arab world. First: The dhikr-e-milad is that in which a recitor (dhakir) recites a verse or hadith and in its explanation makes mention of some of the prophetic virtues and miracles. He also mentions a little of the events of the birth, lineage and the miraculous events which manifested at the time of the birth; as has been written by Ibn Hajar Makki (Allah have mercy on him) in Nimat al-Kubra ala Alim bi Mawlid Sayid Walad Adam. It existed at the time of the Prophet and the companions, however it was not known by this name. It will not be hidden to the experts of the science of hadith that the companions in gatherings of admonishment and learning of knowledge would mention the Prophetic virtues and miracles. It is mentioned in the Sahih works that Master of the worlds (Allah bless him and give him peace) would seat Hassan bin Thabit (Allah be pleased with him) on the pulpit in the masjid, who would recite poems in praise of the prophet…and He [Allah bless him and give him peace] would pray for goodness for him and say, ‘O Allah, aid him by means of Gibril (Ruh al-Quds)’. It will not be hidden to those who view the collection of Hassan’s (Allah be pleased with them) poetry that his poems contain mention of miracles, events of the birth and noble lineage etc. Thus reciting verses such as these is exactly dhikr-e-milad. The account of Hassan’s (Allah be pleased with him) reciting of verses in the masjid is also present in Sahih al-Bukhari and in reality there is no difference between the dhikr-e-milad and this incident. 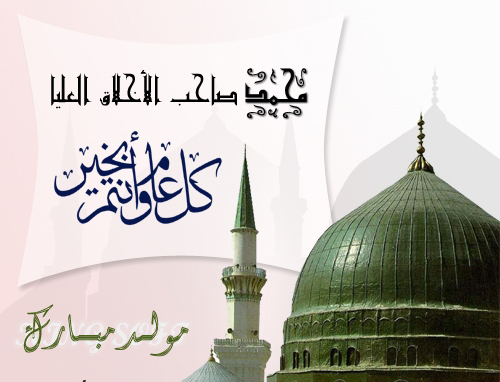 The matter that this dhikr’s name was not Majlis-e-Milad is superfluous. Secondly if there is some discomfort that in of itself the existence of the mention of the birth and virtues is established, however the inviting of people in dhikr-e-milad is not established, then it will be countered that the spreading of knowledge by means of gathering and calling of people is established from hadith. Faqih Abu al-Layth (Allah have mercy on him) in Tanbih al-Ghafilin writes, “…Ali bin Abi Talib said, ‘When the victory of Allah comes’ was revealed during the illness of the Messenger of Allah (Allah bless him and give him and his family peace). Immediately on the Thursday he came out and ascended the pulpit and sat upon it. He then called Bilal and asked him to announce in Madinah that they should assemble to hear the advice of the Messenger of Allah (Allah bless him and give him and his family peace). Bilal called out such that the elderly and the young gathered together, leaving the doors of their homes open. Even those women who veiled themselves came out from their homes, such that the masjid became crowded due to the people in it. The Prophet (Allah bless him and give him and his family peace) said them, ‘Make space for those behind you, make space for those behind you’. He then stood up, praised Allah and glorified Him and sent salutations upon the Prophets. He then said, ‘I am Muhammad bin Abdullah bin Abd al-Muttalib bin Hashim, the Arab, from the Haram, from Makka. There is no prophet after me…’. Apart from this there is discussion regarding the mention of the birth, and for arguments sake if it is accepted that the customary specification (takhsisat urfiyyah) are not established from this gathering, then the dhikr-e-milad being impermissible is not necessitated. It is clear that the actual dhikr-e-mawlud which has been mentioned above is a method from the means of spreading knowledge. Thus here two principles have been concluded, one that the dhikr-e-mawlud is from the means of spreading knowledge. The second is that each of the means of spreading knowledge is recommended. Thus the result is that dhikr-e-mawlud is recommended. And do not be mistaken that when the dhikr-e-mawlud was not present in the time of the three (generations) nor was it evident during the time of the Mujtahids, then why is it possible to give a legal verdict (fatwa) for its permissibility? Yes, if there are unlawful specifications and rules added to the dhikr-e-mawlud then it’s being recommended will no longer remain, however this will then become something else due to which there will be no doubt created regarding the permissibility of the Milad. Addendum: Mawlana al-Luknawi has a number of answers relating to the seperate issue of the standing (qiyam) in a certain part of the Mawlid gathering, which have to be studied carefully to understand in his position. In one fatwa he argues that those who rebuke those who do not stand in Mawlid gatherings are wrong, arguing that standing in the one specific part of the Mawlid had no reliable basis. However in another fatwa he mentions that the people of the Hijaz stand in a part of the Mawlid and that it was present in the Mawlid al-Barzanji. Thirdly, his commendation is present for the work Anwar-e-Satia by Mawlana Rampuri which defends the practice of standing at a part of the Mawlid. Thus it would appear that Mawlana al-Luknawi regarded it as permissible to stand at certain parts of the Mawlid, whilst at the same time censuring those who criticised those who would not stand. And Allah Most High knows best.